Here is another delicious candle which combines techniques from the above tutorials. You can purchase wax banana chips from RND Fake Food Plus. Prep your work area, laying down newspapers to protect surfaces. First trim your wick to the height of your container plus 1 inch. Use wax glue to secure the wick sustainer to the bottom center of the container. Attach the wick holder to the top of the container to secure the wick while the candle sets. Melt desired amount of wax in the double boiler to 180-190 degrees. You want to almost fill the container. Add fragrance and yellow color dye. Once wax has melted, remove wax from heat. Pour the melted wax into the container. Allow to cool and harden. In an old pot melt a small amount of wax in the double boiler to 180-190 degrees. Blend the wax with a mixer on high for 5-10 minutes creating the whipped topping for the top of the candle. 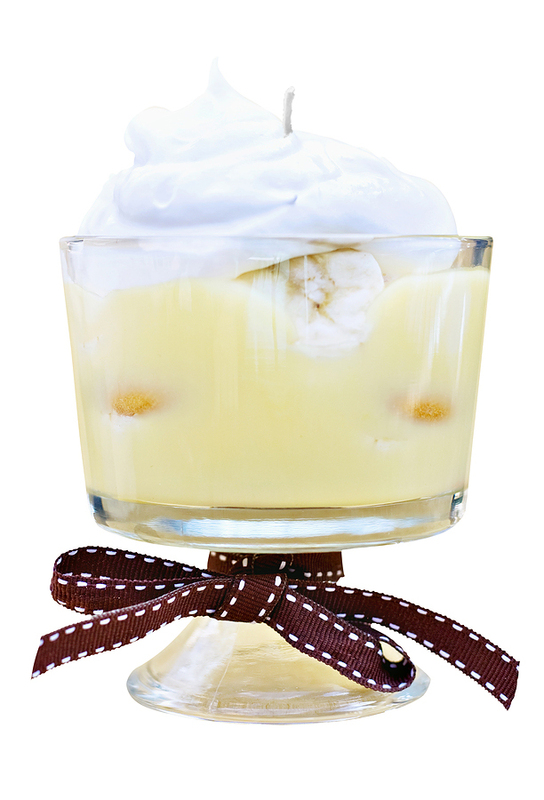 When it is thick and resembles meringue, spoon the whipped wax on top of the pudding candle. Before the topping has a chance to cool, place some of the banana chips into the whipped cream exposing only half the banana chip in a manner similar to real pudding. Allow the wax to cool and harden. Trim the wick and enjoy.